The epic, multivolume Outlander saga is the starting point for a brilliant new series that begins with the novel Lord John and the Private Matter. Filled with intrigue and mystery and starring one of the most popular Outlander characters, Lord John Grey, this fresh new tale is utterly captivating. 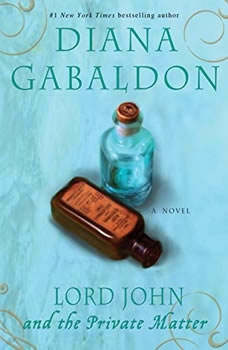 In a richly drawn 18th-century London, Scottish exile Lord John faces a difficult situation. His cousin Olivia is engaged to marry the Honorable Joseph Trevelyan, but he has just observed something of a rather personal nature that, if confirmed, might put an end to any talk of marital bliss. Determined to investigate further, Lord John is distracted when the Crown calls for his services. A comrade in arms has been slain, and to complicate matters, the victim may have been a traitor. Now Lord John has not one, but two puzzling mysteries to solve.